Georgine Saves » Blog Archive » Good Deal: Cosori BPA Free Electric Glass Kettle $29.99 + Ships FREE! TODAY ONLY! Good Deal: Cosori BPA Free Electric Glass Kettle $29.99 + Ships FREE! TODAY ONLY! 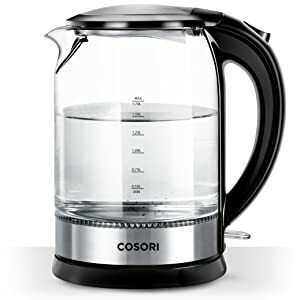 #ad Today only, 1-20-19, the Cosori BPA-Free Electric Glass Kettle is $29.99 plus ships FREE from Amazon.com. This cordless glass boiler hot water and tea heater features an LED indicator light, auto shut-off and boil-dry protection, 100% stainless steel inner lid and bottom, plus a 2-year warranty.